Current lead time for most Stock Items is approximately 3 - 4 days. For Custom Cut Items we're running approximately 4 - 7 days. Our standard plates are NOT meant for outdoor, wet or marine environments. Our custom-cut anodized aluminum nameplates are suitable for outdoor use. Please e-mail for any orders that require shipment outside the US and US territories. 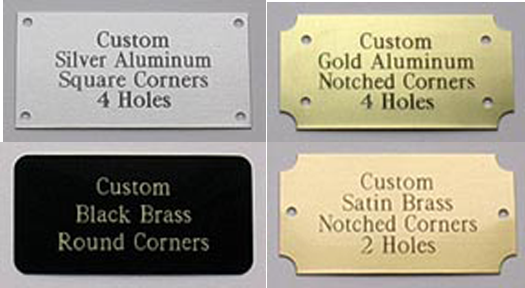 USBRASSSHOP is your reliable source for the highest quality Custom Engraved SOLID Brass Name Plates, Door Plates, Key Tags, Luggage Tags, Horse Plates & Tags since 1999. Most orders ship within two to three days. Standard shipping averages 2-3 days. Our workmanship is Fully Guaranteed. Browse through our site and when you're ready, order with our secure order form. We do not share customer information with anyone, for any reason. We will return phone calls within a day or two.